100 kV -> 5.56E-7 Coulomb. .
Bfield is in the centre weak and near the sides/top/bottom stronger. 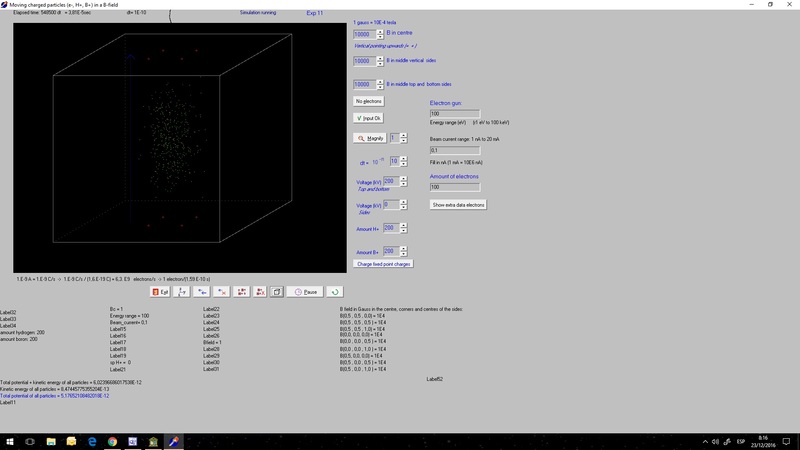 Screenshots\Exp 11.2 screenshot.jpg After 6,21E-5 sec all ions are still confined. 36 T = Strongest continuous magnetic field produced by non-superconductive resistive magnet. 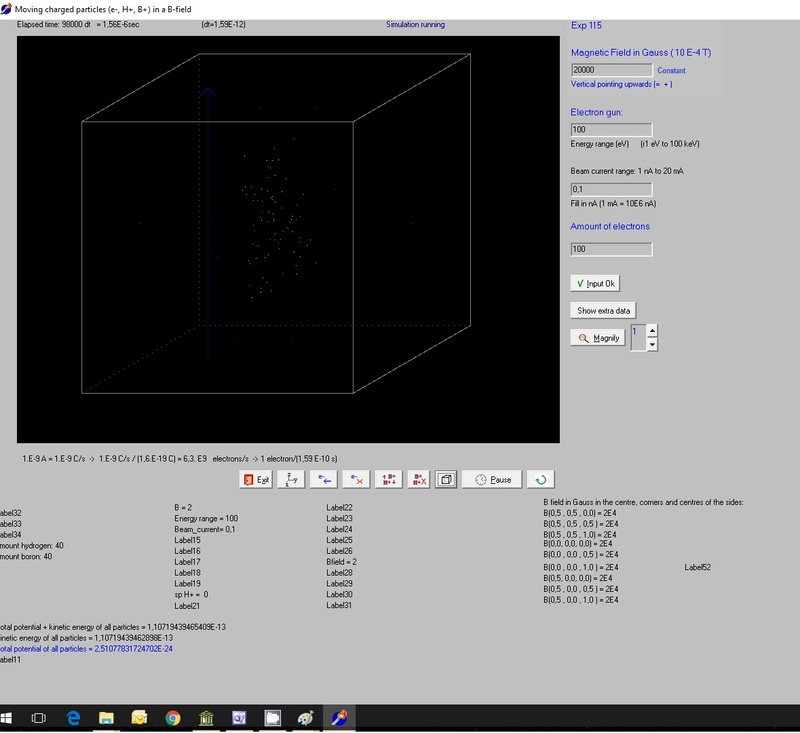 Screenshots\Exp 11.2 screenshot 8.09E-5 s.jpg All ions are still confined. But 48 T is a very strong B-field and difficult to achieve. The heavier B+ ions (11 x heavier than the H+ ions) are spreading out a bit, and some of them escaped (suppose it were B+ ions that escaped; cannot determine this). The ions seem not to interact with each other, but their dimensions, their amount and their charge is relavively very small. When their charge is increased (10000..0x) , then they do interact (collide etc. ), so the formulas in the program seem to be correct. The same as exp. 11.3, with Bfield = 1 T (constant, vertical), but the ions did not have an initial speed. The H+ and B+ ions did not escape. In this time period no ions did escape. The same experiment, but with a constant Bfield of 2 T.
There seems to be not a lot of difference in applying a variable B-field or a constant B-field. In the real world I suppose it will be easier to apply a constant magnetic field.. The same experiment, with a constant Bfield of 2 T, but with 300 H+ and 300 B+ ions. No ions did escape in this time period. With a constant magnetic field of about 1 or 2 T (should be possible to realize..), eight positive charges placed up and down (corresponding to four round conductors with a diameter of 10 cm and a voltage of 100 kV, also possible to realize?) and a same positive charge placed in each of the sides, the positive ions are confined in the simulation program (applying Coulomb force and Biot Savart, non-relativistic); at least during the (short) time period of the simulation. No interactions (colisions) between the ions are observed. The reason of this is maybe because the ions are relatively very small and there are only a very few (in reality there would be millions..). When the charge of the ions is increased a 10000000 times, then yes interactions between them are observed. I let one H+ and one B+ ion collide with each other. If the charge is only increased 100000 times, then they did not collide (dt= 1.59E-14). With dt=1.59E-15 and 100000 times more charge they do collide. The total energy ( = kinetic energy of all particles + potential energy of all particles ) is calculated. The voltage of the top and bottom charge is 200 kV, so the positive charge of each point charge is: 5.56E-7 Q (if each point charge should be a sphere wit diameter 10 cm). There are four point charges above and four point charges under. In the sides there are no charges. 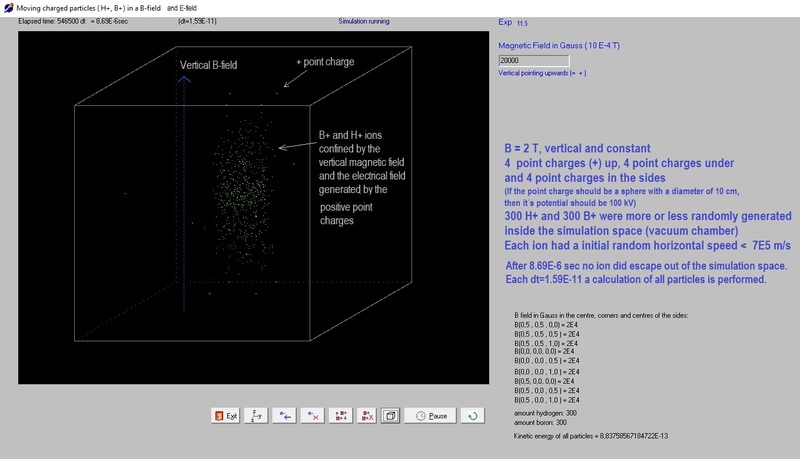 Because there are now also fixed point charges, the potential energy of the moving particles relative to this point charges is also calculated. We started a experiment with 200 H+ and 200 B+ ions. The total energy (= potential+kinetic energy) stayed constant: 6,0239668.. E-12 J. This should be so; it´s an indication that the formulas in the simulation program are correct. 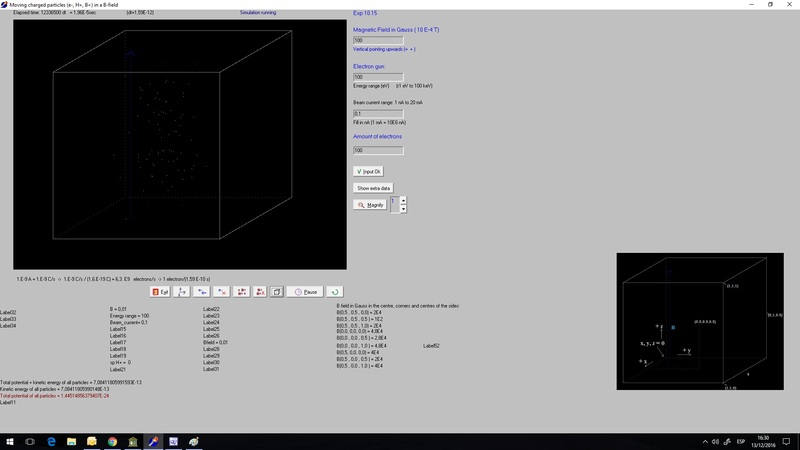 Changed dt=1E-9 s. The simulation is less precise, but faster. At elapsed time = 0,000168 s the the potential energy stayed constant: 6,023966... E-12 J. At elapsed time = 0,000383 s the the potential energy stayed constant: 6,023966... E-12 J. At elapsed time = 0,000537 3 s the potential energy: 6,0240.. E-12 J. (a very tiny change). At elapsed time = 0,00204 3 s the potential energy: 1,738.. E-11 J. . This dt is too big: the simulation is not anylonger precise. 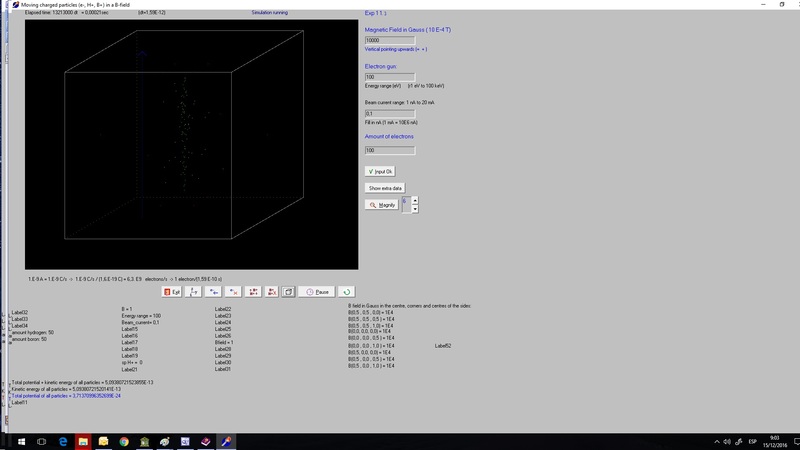 Note: with a speed of 1E6 m/s and a height of 1 mtr of the simulation space (cube) , a particle will travel in 1/(1E6) = 1E-6 s from one side to another side. So it is obvious that we cannot take dt=1E-6 s, and even dt=1E-7 is quite big.